Maggie made delicious crepes for dinner, and I was fortunate enough to be invited over! 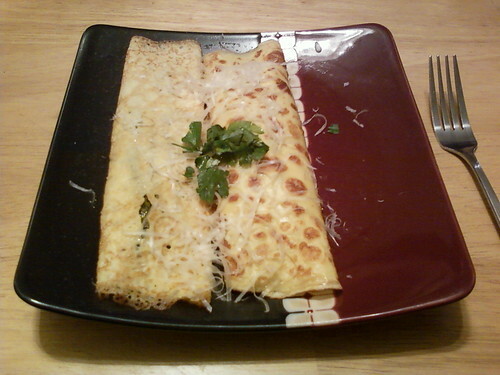 Homemade crepes filled with asparagus and creamy, cheesy spinach. She also made sweet crepes that we filled with various things for dessert (such as apple butter, nutella, jam, etc.). My friend Brandon started the Facebook event, and I was excited to see that people inside and outside the US are taking up this idea and pursuing it this month. A person can observe Plain Dress November in many ways, but there are a few ways I want to observe this simplicity in my life this month. Most fundamentally, I want to find what is most essential in my life. I am meditating on what is most important to me in my present and for my future. I’m going through my house to clean out clothing and items I no longer find useful. I plan to sell them at my friends’ garage sale this weekend, and then will donate the remainder. Regarding clothing, I tend to dress fairly plainly in the first place. While I don’t plan to change my style of dress, my goal is to refrain from buying any clothing for myself during the month of November. Does anyone else value finding simplicity in our lives this month? I think it’s a very meaningful meditation, and I hope learn more about myself in its pursuit.